Malaga has Spain's third largest airport, and it's a common gateway for visitors to Andalusia and the rest of southern Spain. From Malaga, most visitors' preferred destination is Seville, home of flamenco, bullfighting, and some of the best tapas in Spain. You can choose to go from Malaga to Seville in the quickest way possible or get there more slowly and take in highlights along the way. Trains and buses take about the same amount of time, but the bus is cheaper. Or you can rent a car and drive. The Malaga airport has good bus and train connections, and that means you don't actually have to visit the Malaga city center at all if you'd rather spend your time in other parts of Andalusia. There are regular buses throughout the day between Malaga and Seville. The journey takes 2.5 to four hours and costs a bit less than the train. Malaga's bus and train stations are side by side, so their location won't affect which form of transport you take. However, Seville's bus and train stations are all over the city, so check where your hotel is before you book. The 125-mile drive from Malaga to Seville takes about 2.5 hours, traveling mainly by the A45 and A92 highways. If you feel comfortable renting a car and driving in Spain, this would be a good option since it gives you more control of your time, you can stop along the way if you like, and you have easy transportation once you get to Seville. You can also take a guided tour of Seville from Malaga. 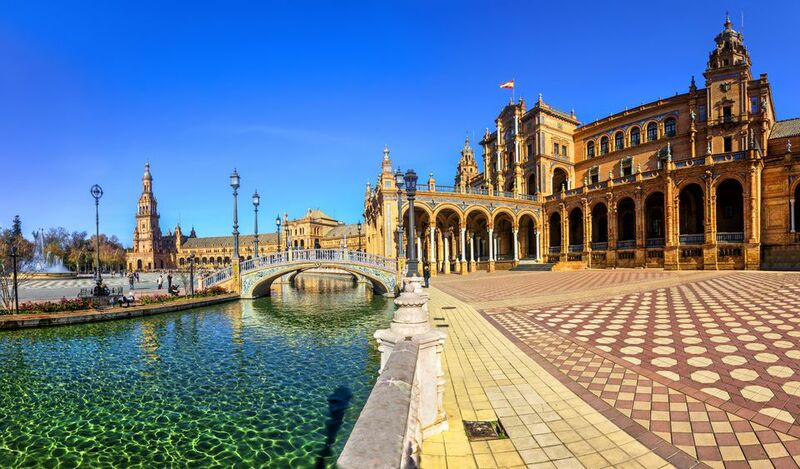 Seville is one of Spain's most impressive cities. It's a vacation in itself, and if you just have one day to see Seville, this might be a good option. The tour, by air-conditioned bus, leaves early in the morning from Malaga and takes you on a day trip to Seville. It includes a tour of the cathedral, a city tour, and free time to explore the city by yourself before returning to Malaga in the evening. If you have two days for Seville, you might like to take this two-day Seville city break. You'll have to make your own way to Seville, but everything else will be taken care of once you arrive at the Seville train station. It only takes around two hours to drive Malaga to Seville. You can set off in the morning and make a stop at Cordoba orf Ronda or both. Since you have a car you can spend the night if you'd like in either place and make the most of your stop. Because of the high-speed train connections from Malaga to Cordoba and Cordoba to Seville, it's actually quicker to travel by train via Cordoba than to go direct. Cordoba's main attraction is the Mezquita, or Mosque-Cathedral, which is around a 25-minute walk from the train station (or take the hop-on-hop-off sightseeing bus). The neighborhood around here is beautiful; the Jewish quarter is one of the most popular sights in the city. Make sure you look into the little courtyards, many of which are beautifully decorated with plants. Take the sightseeing bus or a walking tour of Cordoba and you will easily be able to get the full Cordoba experience in less than a whole day. Then it's back to the train station and on to Seville. Stopping off in Ronda is a little bit trickier than the itinerary via Cordoba because of more difficult transport connections; you'll probably need to take a bus (unless you have a car) because there are few trains from Malaga to Ronda and none from Ronda to Seville Still, Ronda is a fantastic place to visit and if you're going to go, going en route from Malaga to Seville cuts out at least one time you'll need to take a bus. Ronda is most famous for the gorge it sits above, as well as the old bridges that span it. It is also a good city for wine and tapas. Traveling from Malaga to Granada would take you a little out of your way, but not by much. The bus between these two cities takes under two hours, while the bus and train from Granada to Seville both take around 2.5 hours. It is possible, though not necessarily advisable, to visit Granada in a day en route to Seville. The main two attractions in Granada are the Alhambra and the tapas (which come free with every drink in any bar in town). Arrive in time for lunch, go for tapas, and then climb the hill to the Alhambra. As long as you have booked your Alhambra tickets in advance, you'd then have the time to explore the Alhambra before taking a bus or train to Seville. Granada actually deserves an extra day or two. A highlight you'd miss on a quick stop is the medina-like Albaicin Moorish quarter. Alternatively, before heading to Seville, go via Cordoba, stay a night or two, and get the best of Andalusia's cities into a single trip. You can also take a detour via Madrid. It might look out of the way, but because Madrid is on the high-speed AVE train network, traveling from Malaga to Madrid before heading back down to Seville (also on the AVE train) is much simpler than you'd think. Each journey is a mere 2.5 hours long. The Spanish capital is home to some of the best art museums in the world. The day trips from Madrid are the best in the country, with Segovia and Toledo both a short train ride away if you choose to stay a few days in Madrid before heading to Seville. Because Cordoba is on the same train line as Malaga, Madrid, and Seville (in both directions), it's easy to add the city into either leg of your itinerary.